Assess your own performance: Evaluate your Sustainability Performance using the CSRHub ratings methodology, covering the four categories of environment, employee, community and governance. Benchmark your performance with your peers: Evaluate the Sustainability strategy of your competitors, identify the leaders and laggards of your industry and compare your ratings to theirs. 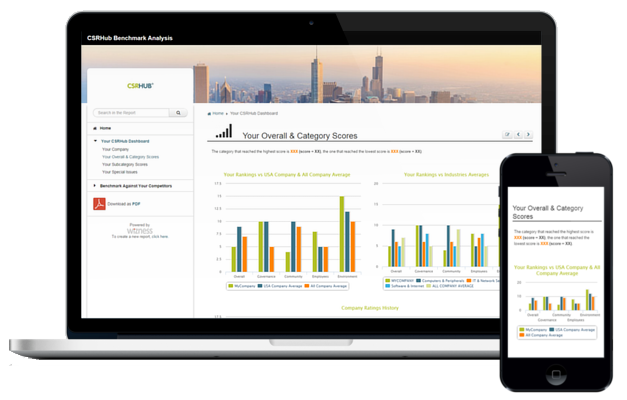 Identify your strengths and weaknesses: By comparing your own CSRHub ratings to industry peers of your choice, the benchmark helps you identify the Sustainability areas in which you excel, or need improvement. Excited about discovering how well you perform? Start your own benchmark now! If you have any questions about this new exciting tool, you can take a look at the FAQ or at the template tutorial when you click Start My Benchmark above. If you don’t find what you’re looking for, we’d love to hear from you! Wizness is an online platform which enables companies to collect their Sustainability data, create their online Sustainability profile, design & publish interactive, mobile ready CSR reports, and engage in interactive conversations with their stakeholders. Through its services, Wizness enables organizations to reduce their reputational risks and communication costs as well as reinforce their brands. Wizness is powered by Enablon, the world’s leading software provider of Sustainability, EH&S and Risk Management solutions. CSRHub provides access to the world’s largest corporate social responsibility and sustainability ratings and information, covering on 13,700+ companies from 135 industries in 127 countries. By aggregating and normalizing the information from 370+ data sources, CSRHub has created a broad, consistent rating system and a searchable database that links millions of rating elements back to their source. Managers, researchers and activists use CSRHub to benchmark company performance, learn how stakeholders evaluate company CSR practices, and seek ways to change the world. CSRHub is a B Corporation, an Organizational Stakeholder (OS) with the Global Reporting Initiative (GRI), a silver partner with Carbon Disclosure Project (CDP), and an Advisory Council Member of Sustainability Accounting Standards Board (SASB).